Toronto, the city of towers, is facing a major challenge as 1.200 high-rise residential concrete frame buildings are approaching the end of their effective service life. In the so-called Tower Renewal Program different parties are trying to improve the quality and the energy efficiency of these high-rise buildings. It will also - indirect - generate social, economic and cultural benefits by creating local green jobs, increasing small-scale retail, and upgrading green space. I spoke with Graeme Stewart, one of the initiators, about the goals and progress. Between 1960 and the mid-1970s many high-rise buildings were constructed in western countries, mostly in the outskirts. Peak productions in housing were reached during this period as an answer to the enormous housing shortages. As far as I know, there has never been a period in house building in which the similarities between countries have been as great. Large open parks between the apartment blocks and a separation of functions were characteristic features (Helleman & Wassenberg, 2004; Van Kempen et al., 2005). In Toronto it was no different. In fact, it was taking the lead by building many estates throughout the City and its suburbs in the post-war boom (today known as the inner suburbs). As a consequence the Toronto area contains the second largest concentration of high-rise buildings in North America. 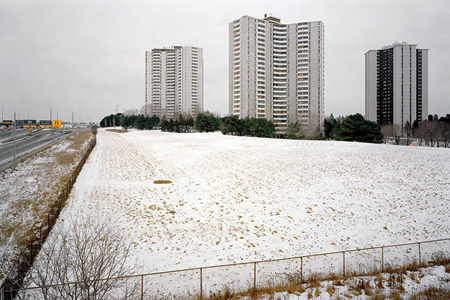 The City of Toronto has 1.200 multi-unit residential buildings built between 1945 and 1984 with 8 stories or more. 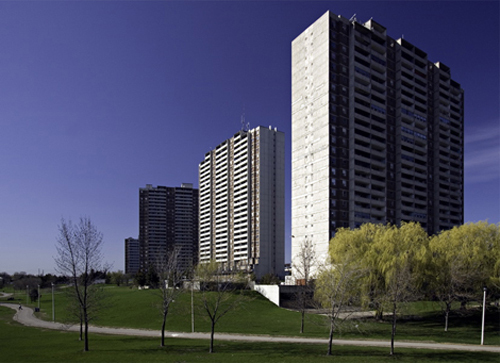 In the Toronto region there are 2.000 high-rise residential buildings. The bulk of these buildings are now aging mid-century apartment towers. They account for nearly a third of the total housing stock. About 90 percent of Toronto’s 1.200 apartment buildings are for-profit, privately-owned rentals. "Distributed among several large companies, as well as an assortment of small to very small ‘mom and pop’ type owners", says Stewart. The City of Toronto, through the Toronto Community Housing Corporation (TCHC), is the largest landlord. It has 134 older high-rise buildings. The average apartment size in the concrete high-rises is larger than the bachelor and one bedroom condominiums being built today. It is common to find units with two or even three bedrooms providing space for larger families seeking affordable rents. The distinctive concrete towers house more than 500.000 people in the City of Toronto, many more in the surrounding suburbs. These are often the first home to new Torontonians who arrive from across Canada and around the world. They are 'Arrival Cities' in the words of Doug Saunders. A quarter of the households in these buildings immigrated to Canada in the last five years. It is also a frequent choice of home for seniors (18% were aged 60 or more). Many of these estates serve an important function for those at the bottom of the housing market. 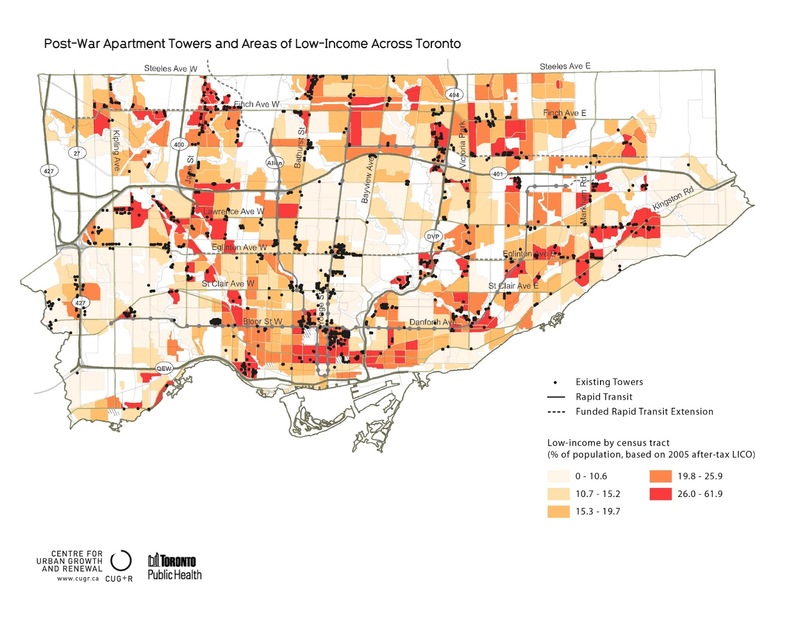 In Toronto nearly 40% of families living in these high-rise buildings have low incomes, with higher proportion living in Toronto’s inner suburbs. Over a third of households had income under $ 19.999. There are different kind of - interlinked - problems (and opportunities) in the high-rise estates of Toronto. According to the - mostly physical - analysis the problems are concentrated around the buildings, the infrastructure, and public spaces (E.R.A Architects & University of Toronto, 2008; City of Toronto, 2008; Cities Centre, 2010). Built between the late 1950s and early 1970s most of these buildings have to deal with physical and social obsolescence. Approximately 60 percent require major repairs and component upgrades of some nature. The majority of these buildings do not make use of modern insulation materials or other energy efficiency measures. Most of them are lacking a ‘thermal break’ between interior and exterior environments. In combination with aging envelopes, exposed slab edges, minimal insulation, single-glazed windows, aging sealants and aging mechanical systems the towers are some of the most wasteful housing. They require upwards of 20 percent more energy per square meter than a typical single-family home. Another problem, which you see often, is that promises of major investments in new rapid transit were repeatedly deferred or canceled from the building until the present. Suburbs that were built with population densities to support high levels of transit use ended up with a sub-standard transit system: the bus. As a consequence, the people who can afford are traveling by car. People without cars have to use public transport to get their groceries, because many neighbourhoods lack the necessary facilities, services and amenities. But the access to public transportation routes is often poor. Trails and cycle tracks were and are on secondary importance. The result is, in combination with poorly maintenance, that it is now often extremely inconvenient and unpleasant to walk around in these neighbourhoods. Public spaces on large housings estates are not given as much attention as is given to public spaces in inner cities. All around the world these estates do not have a citywide significance and they are seen as marginal public spaces with poor maintenance, inadequate use and inappropriate management. The numerous indefensible spaces in and around the high-rise estates, where eyes on the street are missing, are causing livability-problems. The problem with these large-scale park-like landscapes is that it is for everyone and therefore at the same time from nobody. No one is willing to assume responsibility for those large tracts of green spaces. And they are mostly been laid out in such a way that any form of surveillance is impossible (Helleman & Wassenberg, 2004; Van Kempen et al., 2006). That is also the case in many estates in Toronto. The ‘Tower in the park’ concept wasn’t a great success. The areas envisioned as communal recreation space around buildings have become “impoverished, fragmented, underused and inaccessible”. They are surrounded by chain-link fences, are relegated to surface parking and/or feature clusters of disorganized dumpsters (E.R.A Architects & University of Toronto, 2008). Beginning in the mid 2000’s Graeme Stewart of E.R.A. Architects engaged in a research program related to Toronto’s tower blocks, combining technical design and innovative materials work of the University of Toronto with community planning considerations. Including extensive travel research throughout Europe and Russia to analyse a variety of approaches to tower revitalization. 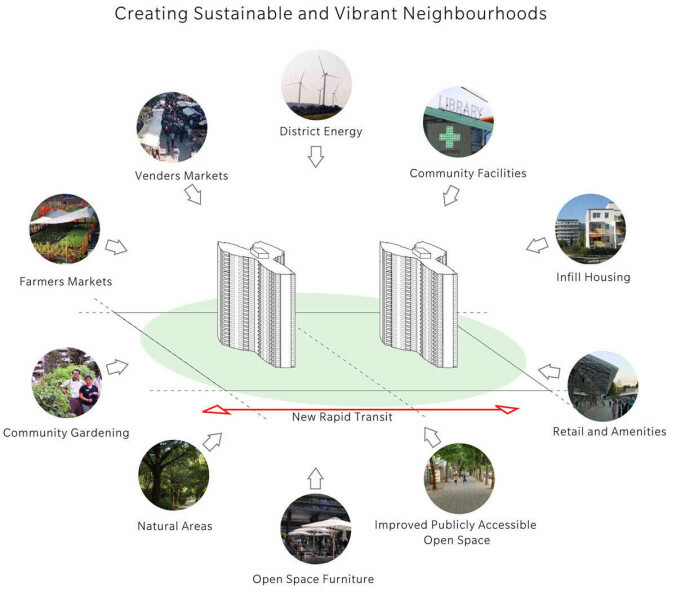 The conclusion was that these sites have great potential for both energy efficiency at high-rise buildings, as well as to emerge as “complete community” through the introduction of mixed-use growth, the provision of shops, services and new housing, and integration into regional networks such as rapid transit. Additionally, the idea is that the retrofit of the buildings themselves can be a powerful driver of community revitalization through local jobs, training, community outreach and education. When they presented their research to the mayor the City of Toronto adopt their ideas and principles. The municipality established the so-called ‘Tower Renewal Office’ within its bureaucracy. It is the central coordination office for the program. ERA Architects and their not for profit research group The Centre for Urban Growth and Renewal) continue to advise this municipal office. But also play a role as researcher, activist, convener, and implementer. 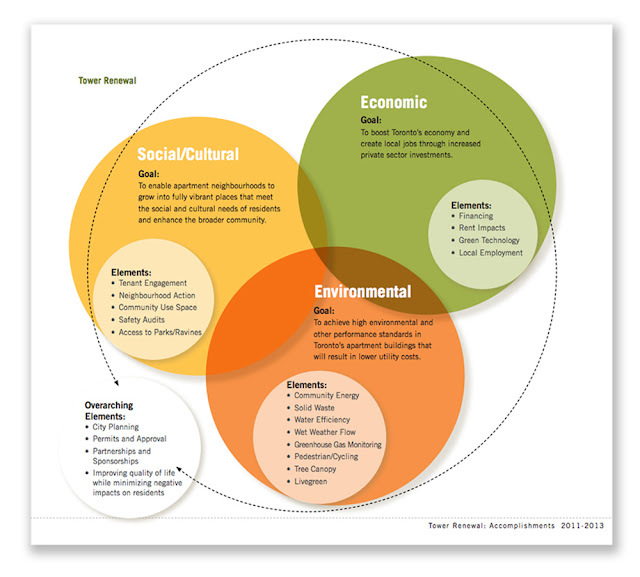 Often outside the scope of traditional architectural practice and always working with key partners: "We expand the initiative through work with partners including the Province of Ontario, Government Organizations such as Toronto Public Health, local community investment NGO's such as United Way Toronto, and most recently with a charity, think tank (Evergreen CityWorks) who facilitate community investment towards a more sustainable city." The Tower Renewal Office define the goals as seen in the diagram. 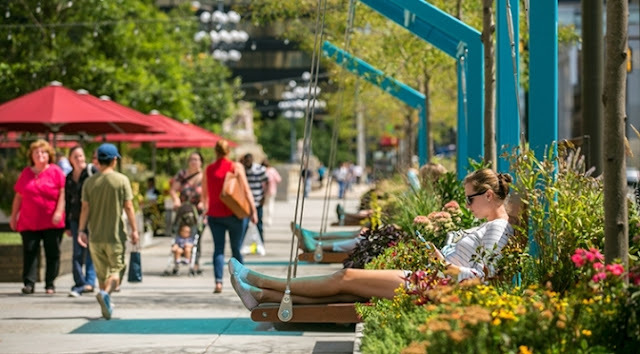 The emphasis is on a cleaner and more healthy environment through significant reductions in greenhouse gas emissions by building retrofit, improved public transportation, cycling and pedestrian options and on-site waste and wet weather flow management. In addition, an attempt is made to make stronger communities through enhanced local economic activity, local job creation, and greater cultural awareness and activities. Much of the efforts goes to the more physical task; making green buildings. Current energy costs and the City of Toronto’s commitments to reduce greenhouse gas emissions favor upgrading existing building stock over demolition whenever possible. Demolition is seen as an incredible waste of resources and besides that there is also no vacancy (as was the case for example in the Bijlmermeer, Amsterdam). The majority of these apartments provide rental accommodation that, in many cases, is affordable and not available in other types of housing. By improving existing buildings residents can remain in place during retrofits and will benefit from a more comfortable environment inside and outside their apartments. 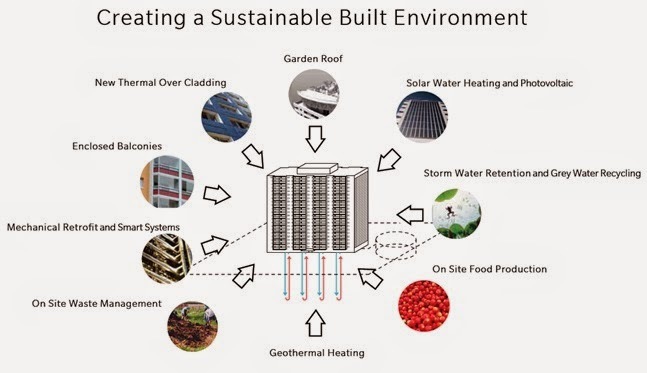 Using best practice in building cladding and related retrofits, demand for heating and cooling the high-rise residential buildings can be reduced by at least 50 percent. The idea is that saving money on utilities, like electricity, gas, water and waste, means lower building operating costs. In turn, the initiators hope that the savings mean that the owners will spend more money on building maintenance and upgrades and less pressure to increase rents. Every year, the Toronto area welcomes almost 100.000 newcomers to Canada. Toronto itself grew by 110.000 people between 2006 and 2011 and is expected to grow by up to 468.000 more people by 2031. Many apartment properties have underused land where new buildings could be built. This could also be an answer to the poor spatial layout in some neighbourhoods, but more importantly it can also create new homes. In many cases without needing to build expensive infrastructure like new water pipes, sewers and electricity transmission lines. "The idea is to keep the apartments as affordable housing", says Stewart, "but also introduce a mix surrounding, including other tenures and types. Affordable housing, as well as market housing. Low rise family oriented units, as well as midrise and potentially new high-rise, depending on market conditions and urban context. We are in the middle of a series of studies examining this issue." Although the potential synergies between the two projects are sometimes ignored by politicians, the Tower Renewal program complements the goals of the so-called ‘Transit City’ (Cities Centre, 2010). A policy that should deliver over 120 kilometers of rapid public transit to every corner of the city, making vital connections to the inner suburbs where there is the greatest need and limited access to services. The Tower Renewal program will also aims to achieve community hubs with community services, gathering and recreation space and new retail. This can probably give a great boost to the public space and function as an important meeting place. According to Cities Centre (2010), part of the University of Toronto, better walkability should be a top priority, particularly as this is the part that private investors are least likely to pay enough attention to themselves. Taking down fences is the first step, but one should also make more places to sit, play, read, talk, walk, rest, meet, shop, interact, and observe (Helleman, 2014). A important way to generate employment and a livable environment is by adjusting the zoning bylaws. The recent zoning bylaws prohibit all but daycares and small convenience stores (clothing stores, banks, drug stores, and coffee shops) from being located on most residential apartment sites (Centre for Urban Growth and Renewal, 2012). As a result the neighbourhoods are unable to meet the needs and expectations of an increasingly diverse resident community. "There is a great demand for food, shops and services, such as childcare, within walking distance. And for more local opportunities for entrepreneurs." What is lacking is a main street, shopping center or any place that could be considered active or public (E.R.A Architects & University of Toronto, 2008). The good news is, that a new zone, called 'Residential Apartment Commercial' (RAC), has been created, which will allow for small-scale commercial and community uses. The RAC will come into effect this summer. The next step is to encourage property owners, residents, small businesses and community agencies to work together to bring retail, services and community programs closer to the current apartments. A journalist in a Canadian newspaper sums it up (Coyne, 2014): "With the new zoning changes, tower-owners will be allowed to act less like simple rent cheque-collectors and more as community developers, intent on increasing the value of their real-estate assets by adding social value to their communities. At least, that’s the theory." The core of the Tower Renewal Program is the physical renewal (buildings, infrastructure and public spaces). But throughout the years there is also attention for more social and economic goals. Something Stewart and his team recognized: "We quickly learned that while energy retrofit has great potential, resident quality of life was a more important priority – shifting recent efforts in this direction." And it is needed, because Toronto is increasingly polarized. Much of the poverty and inadequate services coincides with its aging modern communities, specifically the high-rise estates in question. One of the organizations that’s working on issues like education, language disadvantages, poverty and social cohesion is United Way Toronto (2012). A NGO charitable aggregator, raising $ 110 million a year to be distributed to local Toronto organizations, with a long history of meeting immediate needs. According to them, one of the biggest issues is that the social networks in most of these neighbourhoods don’t exist: “Large newcomer communities from diverse backgrounds mean that local residents don’t speak the same language. 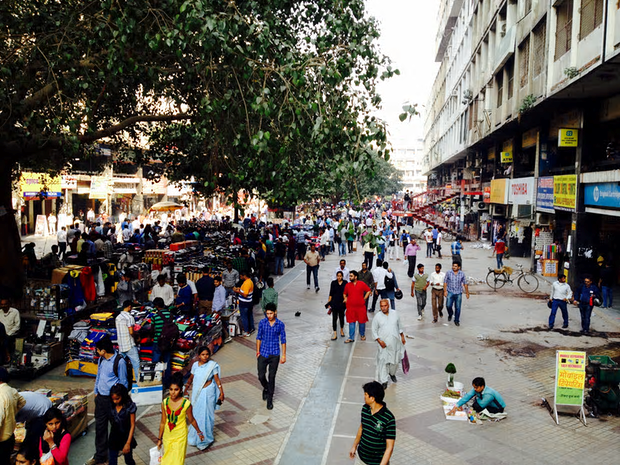 Neighbourhoods often lack the physical space where communities can come together. And even when connections are formed, residents haven’t necessarily had the support they need to tackle community issues.” United Way tries to improve lives through education, income stability and healthy lives. Not from above, but by supporting change from within. Decision-making processes are primarily determined at the local level, “where community needs and opportunities are best understood”. United Way builds partnerships with others to adopt this kind of place-based approach aimed at reducing poverty at the individual level. They helped to design and implement the zoning reform and developed in each neighbourhood a ‘Resident Action Plan’ to identify local priorities and guide community action. Grants are available for local projects, such as playgrounds, community gardens and cultural activities. Residents have completed multiple safety audits and cleaned up many tons of garbage. In partnership with the City, it is building community hubs, where families can come together and access a range of services through the collaboration between community agencies and service providers. In the last years the ‘planned city’ is catching up. Thousands of interviews were conducted with residents. “The consultation, workshops and surveys have shown that a majority of the residents like their flats and their neighbours. But they also noted problems, mostly about a lack of convenience in the neighbourhood (food, shops, daycare, children's play area's, improved transit), lack of jobs, issues with safety, and cost of rent. The goal of the Tower Renewal Program is to address as many of these as we can.” Energy saving measures and intensification are - interestingly enough - not mentioned as priorities by the residents. One of the biggest challenges to implement this approach is the diversity of partners. In most European countries the buildings belong to housing associations and/or the public sector. In Toronto the buildings and their surroundings are mostly privately owned (commercial parties, developers, pension funds). And the public space is owned by the municipality, often only consisting of the small sidewalks and pavements between the tower property line and the roadway. Making it extra hard to get all the stakeholders with their own interests together and making the necessary partnerships between the public, private and voluntary sectors. I asked Stewart about the progress of this complex challenge: "The past several years has been dedicated to changes to city policy in support of Tower Renewal, such as new zoning, updated planning frameworks, etc. It has also been dedicated to working with communities to engage in community based pilot projects and understand resident needs. Now - to answer your question - we are engaging market sounding and consultation with building owners, to work with them to examine potential changes to business practice to engage in renewal, as well as identify financing and policy gaps that may be addressed through further changes in regulation. As you mentioned – this is indeed complicated!" The zoning reform is one of the biggest achievement so far. Being an important precondition for further actions. In regards to energy reduction, the Tower Renewal Office began directly engaging owners across the City in 2011. From 2013, this has including the offering of finance tools working in partnership with the Toronto atmospheric fund to aid in project finance. "At this moment dozens of buildings have engaged in substantive upgrades in partnership with the City, from lighting and toilet retrofits on the low-end, to the installation of renewables, and in a small number of cases envelope and window upgrade on the high-end." And as for the social pillar: "The City’s social development division, Toronto Public Health and United Way have all developed capacity and programs for direct community investment. While often previously ignored, Tower Neighbourhoods are slowly becoming the center of many of the City’s engagement, service delivery and outreach." Besides these first tentative achievements, the research and analysis towards unlocking project gaps goes on. The biggest challenge however is how to make all the wonderful ideas and ambitions really happen in the context of vast majority private ownership. It is taking a lot of lobbying efforts to convince the property owners to invest in the building and to convince politics to invest in better transit and public spaces. There are a number of private owners that are committed to the vision, but it is still waiting for more concrete actions. "Of course the largest obstacle is cost, but things are working in a very positive direction. Action plans are made and we have just started an initiative with several partners to develop new finance and policy tools to aid in realizing a showcase and Tower Renewal on the larger scale." I'm very impressed by the high ambitions and interesting ideas and approaches. It has been an enormous task to put these neighbourhoods on the political agenda. Despite all the research and all the efforts, I still have the feeling the parties are quite ambiguous for the right approach. Although this is difficult to assess from a distance, it seems that they have been seeking (and maybe still are) for the right balance between a top-down, problem-, supply-oriented approach and a bottom-up, demand-driven approach. Is it an urban approach that is spread over all neighbourhoods or is it a place-based approach that focus on the individual level? That will vary by theme, but at a certain time these things need to come together. The great thing is that the research unlocked all the opportunities and measurements imaginable. The task is now to find the right solutions that - most importantly - fits each neighbourhood. This means a differentiation in approach. One that meets the needs and identity of the specific neighborhood. A vision that Stewart shares with me: "Developing the framework and goals for a project of this kind is only possible through knowing your city; researching, engaging, and spending time on the ground." The new zoning bylaws and intensification ideas are two of these great possibilities to upgrade the neighborhoods. They both however needs to be carefully 'planned'. They both should contribute to vitality and livability and not just result in more density and floor space. Because more profit for investors and attractive new dwellings does not ensure more attractive areas (Cities Centre, 2010; Van Kempen et al., 2006). It is commendable that the Tower Renewal Program also aims at increasing employment by developing retail and commercial activities and through the renovation of the buildings. But to really improve the economic opportunities of the inhabitants measurements should be carried out on the national or regional level. In my opinion, only additional actions can be made at the local level, such as training and connections to information networks about employment and job opportunities. In this way there can be a (better) match between demand and supply. But probably the best measure is to arrange rapid public transit, so that everyone can travel - easy, fast and cheap - to work. For the more physical task the success will mostly depend on the way the City and other partners can persuade and convince the property owners to take action. The success or failure of such a partnership depend mostly on the willingness to participate, the enthusiasm to contribute, the commitment to a common outcome, the openness and trust between partners, and the relative balance of power among partners (Van Kempen et al. 2006). That's a tough job. Joining forces by concentrating on one or two estates can help to make a 'best practice' which can be used as a role model to persuade other investors (at the time of writing, development of so-called ‘Showcase’ projects is underway). On the other hand, it's a matter of customization. Taking it step by step. Or, as Stewart rightly says: "The project is predicated on partnership and collaboration. Change can only happen through setting the conditions for success, and aiding in ‘moving the market’ through incentives, opportunities and examples. It is not and cannot be a ‘master plan’, but rather incremental and pragmatic". Which takes time. "We’re too often taken by grand master plans, but never showcase the hard work in the weeds. Rarely does big change happen overnight, but requires creating the conditions in which change can happen, shifting cultural attitudes, and even changing legal frameworks." This article was created following the webinar that Cities of Migration and Centre for City Ecology organized about Arrival Cities in general and the Tower Renewal Program in particular. Special thanks to Graeme Stewart of E.R.A. Architects for his informative answers, openness and for sharing his passion. Katerina Cizek (2010) The thousandth Tower; Stories from inside a Toronto Suburban Highrise. Centre for Urban Growth and Renewal (2012) Strong neighbourhoods and complete communities: a new approach to zoning for apartment neighbourhoods. United Way Toronto. City of Toronto (2015) Tower Renewal. Toronto. City of Toronto (2013) Tower Renewal Accomplishments 2011-2013. Toronto. City of Toronto (2008) Mayor’s Tower Renewal; Mayor’s Report. Toronto. Todd Coyne (2014) United Way, Tower Renewal program: Overcoming the challenges of tower-block neighbourhoods. Toronto Star. E.R.A Architects & University of Toronto (2008) Mayor’s Tower Renewal – Opportunities book. Toronto. 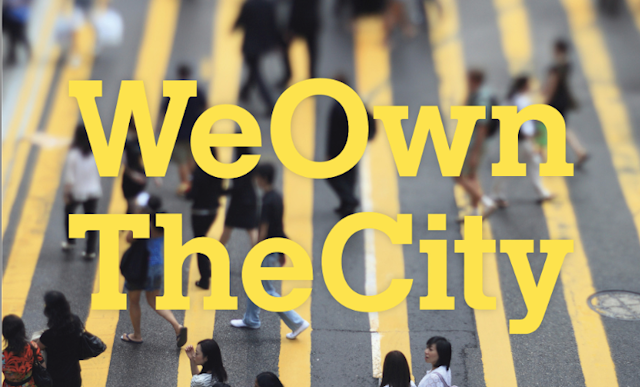 Gerben Helleman & Frank Wassenberg (2004) The renewal of what was tomorrow’s idealistic city. Amsterdam’s Bijlmermeer high-rise. In: Cities, 21 (1). Gerben Helleman (2013) Making Vital Public Spaces: the power of observation, community wishes and activities. Urban Springtime. Gerben Helleman (2015) Arrival cities: the need for precision. Urban Springtime/City Builder Book Club. Ronald van Kempen, Karien Dekker, Stephen Hall and Iván Tosics (2005) Restructurering large housing estates in Europe. The Policy Press. 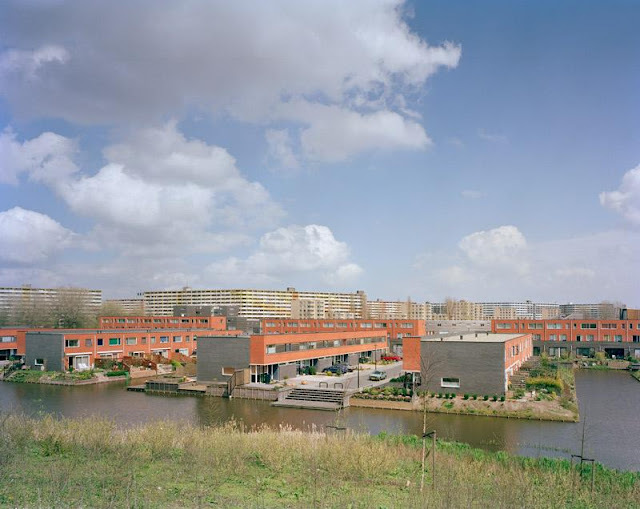 Ronald van Kempen, Alan Murie, Thomas Knorr-Siedow and Iván Tosics (2006) Regenerating large housing estates in Europe. RESTATE/ Utrecht University. Doug Saunders (2010) Arrival City: How the Largest Migration in History Is Reshaping Our World. Cornerstone. United Way Toronto (2011) Vertical poverty; Declining Income, Housing Quality and Community Life in Toronto’s Inner Suburban High-Rise Apartments. Toronto. 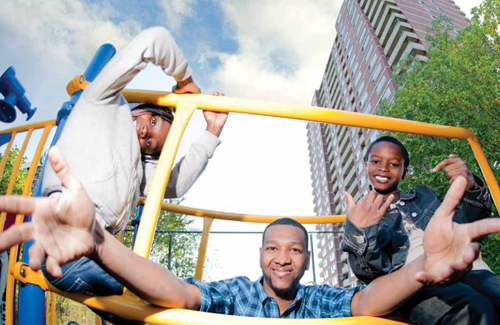 United Way Toronto (2012) Building strong neighbourhoods; closing gaps and creating opportunities in Toronto’s inner suburbs. Toronto.